Nearly every business depends on strong teams to perform at peak capability. And, business leaders employ several tactics to get their teams up to speed, including leveraging team-building gifts. As psychologist Bruce Tuckman famously described back in 1965, teams commonly follow the model of “forming, storming, norming and performing.” It is the leader’s job to move the team through to the performing stage as quickly and as seamlessly as possible. But, how do you get there? And how are other organizations navigating this challenge?In this Blue Paper, we take an in-depth look at team-building trends in the workplace, including original findings from a recent 4imprint® survey; the strategies and tactics organizations are using to support and grow strong, functional workplace teams; and tips on how you can encourage and build high-performing teams to meet your organizational goals. A recent 4imprint survey conducted via online panel at the Association for Talent Development conference took a look at how organizations train their employees to work effectively in teams. The survey, conducted in mid-2017, shed light on how organizations support, fund and structure effective teams. Here’s a look at what the survey found. Successful teams create engaged and satisfied employees. Teams are where it’s at. The majority of survey respondents, regardless of their industry or company size, said employees work frequently in teams within their organization. In total, 47.3 percent of respondents said their employees always work within teams, and another 47.8 percent said their employees sometimes work in teams. Respondents from organizations of more than 1,000 employees reported the highest percentage of staff who work in teams, with 39 percent reporting they always work in teams, and 35 percent saying they sometimes work in teams. Working as a team isn’t enough, though. The team has to work well together to truly be successful. Great teams pay dividends in several ways. Recent statistics show that companies with engaged employees earn up to 2.5 times more income than competitors with low employee engagement. Meanwhile, in a study by SalesForce®, respondents cited poor collaboration or communication as a primary cause of workplace failures. Team-building efforts positively affect results. What’s more, staff with high engagement levels are 87 percent less likely to leave a company than those who are only minimally engaged. As you’re considering team-building strategies, consider team-building gifts as rewards for a job well done, incentives for innovations, or as tools to help teammates feel connected to a common mission. Offer support and training opportunities to increase team effectiveness. According to the survey results, 41 percent of companies with at least 1,000 employees train staff on teamwork skills. Meanwhile, at 21 percent of midsize organizations with 250-499 employees, teamwork training is most likely to be given to executives. And among smaller organizations with 100-249 employees, just 6 percent are likely to provide team-building skills only to their executive team. What the survey shows is that companies have an opportunity to increase team performance by providing training in communication, effective listening and project management. Why are these skills important? In an effective team culture, members fully understand how their teamwork feeds into the company’s strategic plan and ultimate success. The result: team members feel like they’re part of something bigger than themselves, which is proven to increase employee engagement and work satisfaction. Yet our survey found not all training is created equal. Of survey respondents, 62.4 percent said their company offered communication training, making it the most common type of teamwork training offered across all industries. Meanwhile, effective listening and project management were among the least common offerings. The bottom line: organizations can greatly benefit from educating employees to be more effective team players. It can be challenging, especially when you’re bringing together staff with very different skill sets and personalities. Building healthy work relationships can lead to increased job satisfaction. Here are some simple tips on how to forge winning relationships at work. Share these ideas with your employees and you could see big rewards. Show gratitude. Remind employees to thank their coworkers. Receiving thanks is a proven way to boost optimism and an employee’s sense of self-worth. Go the extra mile. Workers can boost the office mood by simply being thoughtful. Encourage them to contribute to the daily chores of the office, such as refilling the printer paper, making a pot of coffee or picking up treats for a morning meeting. Little things can make a big difference in the office atmosphere, especially if everyone contributes. Kick drama to the curb. Encourage your employees to avoid participating in office gossip or complaint sessions. Focus on solutions to create a more positive atmosphere. Be honest about bad habits. Have employees take a good, hard look at what they do that may be irritating to others, and then help them find a way to break those habits. Create a culture of sharing. Everyone brings their own unique skills and qualities to the table. Create a sense of teamwork by encouraging everyone to contribute their knowledge and expertise. Then, consider rewarding those who regularly contribute with thoughtful team-building gifts. Provide the resources your teams will need to achieve success. Most companies are not only recognizing the value of teamwork, they are investing in it. 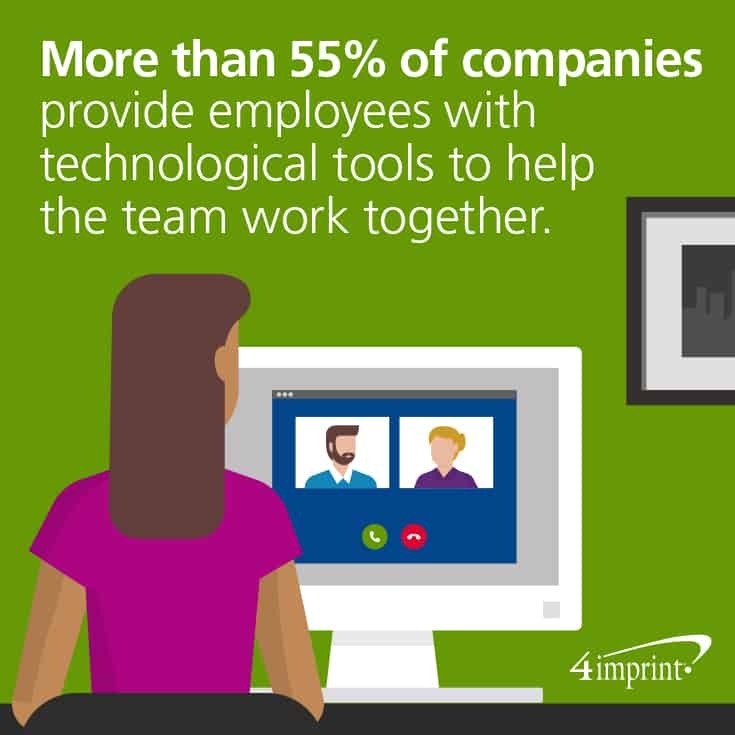 More than 55 percent of survey respondents said they provide employees with technological tools, like project management and video conferencing technology, to help the team work together. The largest companies tend to offer several resources to encourage team building, our findings show. It’s important to note that respondents said in-person meetings are happening less often than they have historically, especially in small to mid-size organizations, which is just one reason why investing in technology pays off. It may come as no surprise that challenges can derail even the best-laid plans when it comes to teamwork. According to a recent Gallup® poll, even if employees feel connected to their teammates, they risk losing their way if members don’t understand expectations, lack access to the right tools or aren’t able to contribute their skills toward the goal. The report says that instead of functioning like a well-run machine, team meetings may degrade into complaining sessions. Companies can address issues head-on by establishing clear expectations, ensuring teams have the needed resources to achieve goals and making sure those with specialized skills are able to fully contribute. Encourage team unity with team-building gifts. According to our survey, team-building giveaways are a popular choice for creating strong teams. 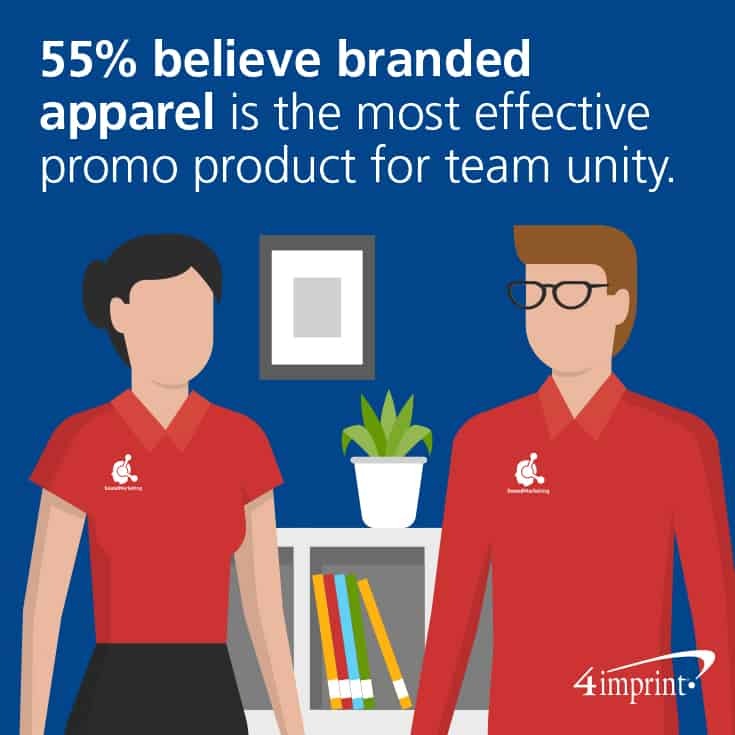 About 55 percent of survey respondents said in their experience, custom branded apparel is the most effective product for promoting team unity. Bridget Kane, marketing coordinator for Fair-Rite Products Corp., knows first-hand the importance of building a sense of team with a remote workforce. About 45 distributors and reps who sell Fair-Rite electromagnetic components come together from around the world every three years for a sales conference at their factory in Wallkill, N.Y. They learn about the company’s emerging products, and the sales conference is the perfect time to promote team bonding. To show sales reps and distributors they are appreciated, and to help them feel like they’re part of the Fair-Rite team, Kane ordered a wide variety of team-building gifts. She selected the Big Lanyard – 7/8” – 36” – Snap with Metal Bulldog Clip and the useful Ruler Notebook with Flags and Pen. Women received the Pilbloc V-Neck Button Down Cardigan Sweater – Ladies’, while men received the Tipped Colorblock Wicking Polo – Men’s, and conference attendees could keep their new duds dry with the ShedRain® Super Mini 42” Umbrella. “So really they left with a whole bunch of Fair-Rite gear, and they were happy about it. I was told by a majority of them that these were the best giveaways they ever received,” Kane says. If you’re looking for team-building gift ideas, knowing what works at other companies may help. Our survey results ranked logo’d apparel as the most popular promotional at 57.8 percent. Polos, sweatshirts, jackets and T-shirts were followed by custom printed pens, with 43 percent of respondents saying their organization sealed teamwork in ink. Branded drinkware was at 42.5 percent, and custom totes/bags were at nearly 39 percent to round out the most popular promotional products for encouraging team unity. Strategizing ways to help a remote workgroup stay engaged and feel connected is a necessity. Global Workforce Analytics reports that 63 million Americans worked remotely at least part of the time in 2016. Fostering strong teams with a virtual workforce can be challenging—and if you’re brainstorming ways to make that happen, you’re not alone. For more inspiration on how to keep those virtual staffers engaged and happy, team-building gifts may help. Creating great teams takes time. So, if your organization is just beginning to build the foundation, you’re most certainly not alone. As our survey results indicate, teams benefit from having the right tools at their fingertips, appropriate direction and clear expectations, an equal mix of listening and sharing, and thoughtful team-building giveaways. With a strong foundation in place, your team’s productivity is likely to reach new levels, and members’ engagement and satisfaction are likely to rise as well. All of this leads to a positive effect on your organization’s bottom line. As a bonus, your staff will be proud to wear team-building gifts that bear your brand, knowing they’re a part of a winning team.